Solid Hardwood or Engineered Wood Flooring? Solid Hardwood or Engineered Wood Flooring? Solid Hardwood or Engineered Wood Flooring? Wood flooring comes in solid and engineered construction. Solid-wood flooring features strips or wide planks composed entirely of one wood species. Traditional parquet flooring tiles, made up of individual wood slats that form geometric patterns, are another solid-wood option. The type of subfloor in your home will, in part, dictate your choices regarding solid-wood and engineered-wood products. 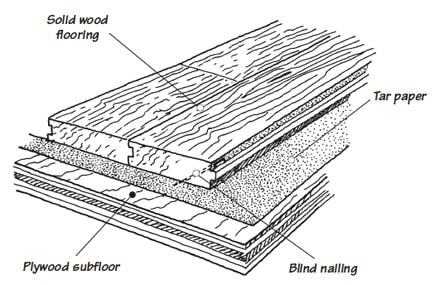 A plywood subfloor will allow you to choose any installation method—nail-down, staple-down, glue-down, or floating. A concrete subfloor will usually require an engineered-wood product applied via a glue-down or floating installation method. In 2007, the National Wood Flooring Association (NWFA) approved guidelines for the installation of certain types of solid-wood flooring over concrete using the glue-down method, although the organization cautions that only a knowledgeable installer should attempt this. When one conjures up an image of a traditional wood floor, it usually is classic solid-wood flooring. Solid-wood flooring features strips (up to 3 inches wide) or planks (greater than 3 inches wide) made exclusively from one wood species. Such strips and planks, each cut from one piece of lumber, feature tongues and grooves (tabs and slots) on their long, vertical sides that allow them to fit together. Parquet flooring is another solid-wood flooring option. Parquet flooring tiles are made from small pieces of solid wood laid in intricate geometric patterns such as herringbone or basket weave. Older parquet floors may have individually laid pieces, but modern floors are typically laid in 6- to 12-inch tiles. Most solid-wood flooring is 3/4 of an inch thick and is installed over a plywood subfloor by nailing or stapling down the strips or planks. 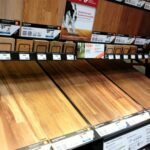 Recently, however, some manufacturers have started offering solid-wood flooring products that come in other thicknesses such as 5/16 of an inch. Because solid-wood strips or planks expand and contract significantly with temperature and humidity changes, they are particularly susceptible to the effects of moisture. Be sure to check the moisture conditions of a concrete slab before considering installation on top of one. Also be aware that because of solid-wood flooring’s sensitivity to moisture, it should never be installed in a below–ground level room such as a basement. Throughout its lifetime, a solid-wood floor can be sanded several times—down to 1/32 of an inch above the tongue of the strip or plank. Engineered-wood flooring strips or planks have a wood veneer surface covering several layers of plywood, MDF (medium-density fiberboard), hardboard, or particleboard. Solid-wood flooring has the benefit of being able to be sanded down and refinished several times—engineered wood flooring can’t be. Engineered-wood flooring, however, is less susceptible to the effects of moisture and temperature changes and offers more—and sometimes easier—installation options. Though solid-wood flooring is a perennial favorite, engineered-wood flooring has soared in popularity in recent years. Engineered-wood floors are generally more affordable and easier to install than their solid-wood counterparts, and they can be laid down below grade (below ground level) and on any type of subfloor. The hardwood veneer, or “wear layer,” generally ranges from 0.6 to 5 millimeters in thickness. 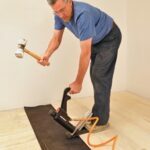 Try to buy the thickest top layer you can afford as the thickness determines how many times you will be able to sand down the floor and, therefore, how long your floor will last. 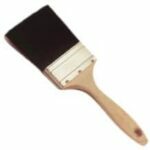 A good product should allow you a complete sanding two to three times over the lifetime of the floor; a lesser-quality product can only be sanded once. 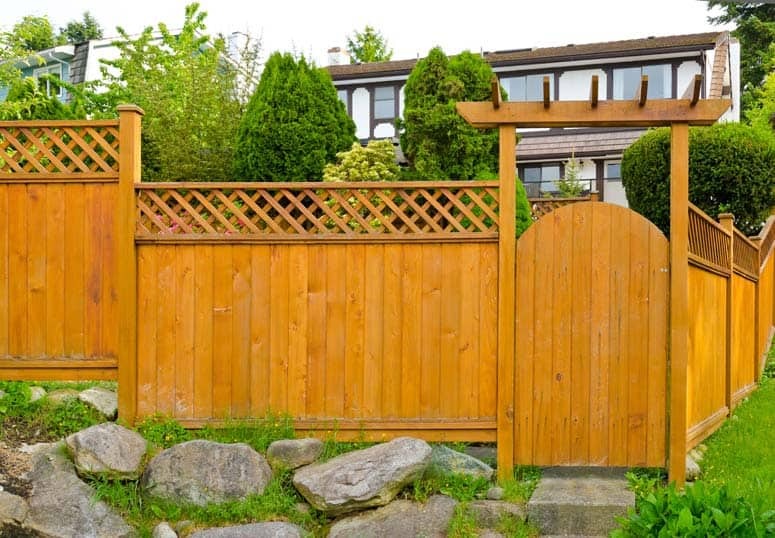 Beneath this veneer sit 3 to 10 cheaper wood layers, usually made of plywood. These “plys” lie one on top of the other, with the grain pattern alternating direction with each layer. This construction is what gives engineered-wood flooring its strength and stability and also makes the floor less susceptible to the expansion and shrinkage caused by fluctuations in temperature and humidity that solid-hardwood floors experience. Because of these qualities, engineered-wood flooring can be installed in areas where solid-wood flooring typically cannot, such as over concrete subfloors or in basements. Most engineered-wood floors are installed over plywood subflooring, but they can also go over smooth concrete slabs or existing, sound vinyl flooring. 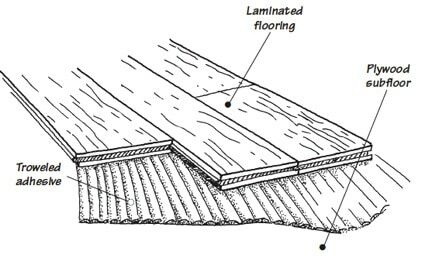 On a plywood subfloor, some types can simply be glued down with adhesive. Laminated floor may be applied over a troweled adhesive. 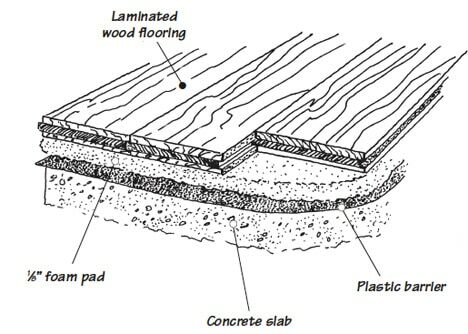 As with solid-wood floors, engineered-wood planks and strips feature tongues and grooves (tabs and slots) on their long, vertical sides, which fit together. Unlike solid-wood floors, however, engineered-wood floors can be “floated”—installed without gluing or nailing down the planks or strips to the subfloor. “Floating floor” is installed on a foam pad. 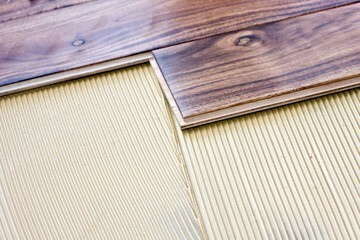 Some engineered products, often called “click-together” or “lock-and-fold” floors, allow you to snap them in place without the need for adhesive between the strips or planks. The floor rests on a thin foam pad. Over concrete, a barrier of 6-mil plastic seals out moisture.